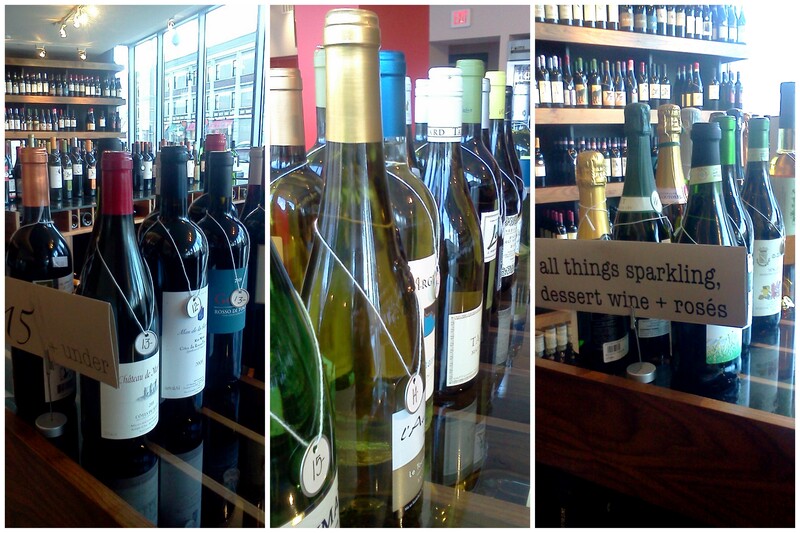 My co-worker and I have been hearing about Central Bottle Wine & Provisions for quite some time. Being that it is brought to us from the fabulous crew of the Blue Room, we knew that the shop would not disappoint. Plus, if you follow these guys on Twitter, you know how passionate they are about their shop and what they are doing. After a delicious and extremely filling brunch at the Langham, we knew there was one more stop we needed to make, it was now or never. It is funny to see the way people’s brains work. 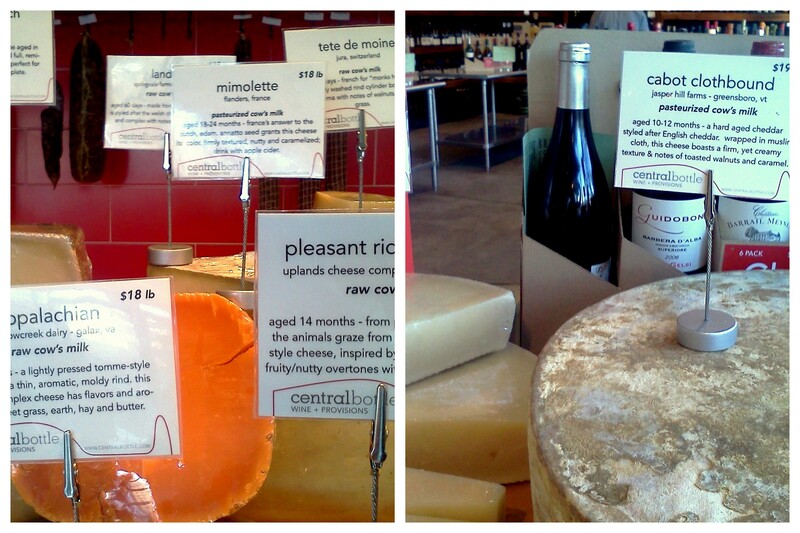 The second we walked into this fabulous shop, I walked directly over to the cheese counter! You know where my priorities lie! The cheeses were mind-boggling. And better yet, they focus on local artisan cheeses! How awesome is that! There were all the selections that I have been trying to find and having no luck. I picked up a Mimolette and the Cabot Clothbound Cheddar I have been looking all over for! And man….these are dangerous! The mimolette was smooth, with slight crunch, and a very smooth nut and butter flavor. Lara and I mused that with its bright orange color, and moldy-looking rind, it looked like a beautiful slice of cantaloupe! The Clothbound Cheddar had a similar flavor to the Mimolette, however it was slightly sharper with a flavor that lingered a little bit longer. Both of these cheeses were huge wins, and when I paired them with the Fig Preserves that I received at the Boston Food Bloggers launch party (courtesy of Whole Foods) they became a dangerously addictive treat! But what about the wine, you ask. Well, I must first admit that I am by no means a “wine person”. However, if I were looking for something, I would definitely head back to Central Bottle. Their wines were set up in a very approachable manner. They had rows that were set up by price range, and others set up by region. But the very best way to find something you are looking for here, ask one of the EXTREMELY friendly, knowledgable and helpful staff! Lara was in the market for some wine, and explained her preferences and price range to the gentleman helping us. He enthusiastically went through the racks and picked out several bottles that matched her requests. He then went through each one and told us all about it. In no way at all would I feel intimidated heading in here with my very limited wine knowledge! Central bottle also had a couple amazing looking artisan “grab & go” sandwiches available. They do something new in this department everyday depending on what they are stocking that day. They looked almost too beautiful to eat, but to beautiful not to eat! I noticed the small selection of hanging salumi behind the counter only after I checked out. But it will definitely bring me back! Besides my cheese, I scored a fresh, crusty, Iggy’s baguette, and some Moroccan Poultry Seasoning. But don’t worry, I will not stop visiting until I have made my way through all of the cheeses and the salumi! This entry was posted in Reviews and tagged blog, blogger, boston, cabot, cabot clothbound, cambridge, central bottle, central square, cheese, mimolette, review, salumi, wine by reneeh. Bookmark the permalink. I love Central Bottle. It’s so close to my place but sort of in the opposite direction from how I walk. This is a great reminder to head there soon! I adore Central Bottle. They actually have some great food events there on a regular basis! I’ve so been wanting to get to Central Bottle! I want to try one of their wine tasting evenings.